I'm submitting photos of our partially homemade and partially store bought Halloween costumes. 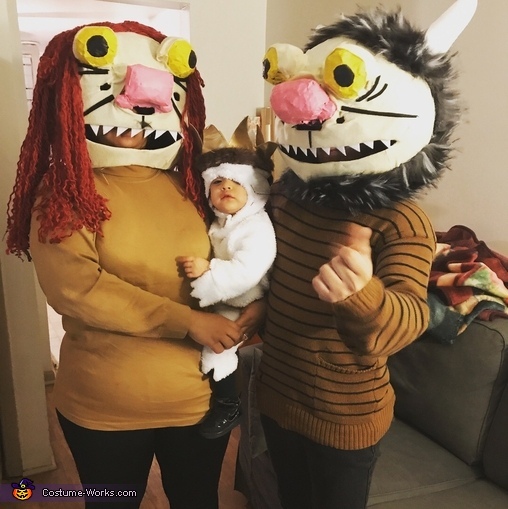 We decided to dress up as characters from the book/movie Where the Wild Things Are. We stumbled upon a costume of Max from the book/movie online and thought it was too cute to pass up. Once we had purchased it, we tried looking for monster costumes for ourselves but could not find any for adults. So rather than return the costume, we took matters into our own hands and decided to make them. We made the masks out of paper-mache that we covered in felt and fur and yarn! The process of making the masks was fairly easy, but it did require a lot of patience and time. We made the eyeballs and nose by balling up some newspaper, glueing them onto the incomplete paper-mache balls we had been making for the masks, and putting paper-mache over to minimize the wrinkles and give it a cleaner look. We painted the nose and eyes before putting anything on the mask, so no paint would get on the felt or fur, we also cut out the mouth so as not to have difficulty doing it after everything else was on the masks. For the Carol mask, which my fiancée is wearing, we had to make horns which we made from styrofoam cones that we sanded down. We put felt all over the mask, glued on the horns, and then added the fur. For my costume, which was KW from the book/movie, we pretty much did the same thing except instead of fur we used yarn for KW's hair. Since we have a little girl we decided instead of King Max, she'd be Queen Maxine. We got her a scepter, but she lost it trick or treating. It was great seeing how everyone loved our costumes and recognized where our costumes were from. Total for all our costumes I believe we spent around $150 and it was definitely worth it. Thank you in advance for looking at them, we went countless late nights working on them.